Depending on how you view the “fundamentals” of firearms, there are either 7 or 9. The standard 7, often spoken on, instructed, discussed and demonstrated are: Stance, Grip, Draw (or shouldering for the rifle) Sight Alignment, Sight Picture, Breathing and Trigger Control. Of these seven, the most important often are trigger control and sight picture. Anyone into training and practicing likes the physical act of pulling the trigger (or pressing, squeezing, pushing, whatever term you use for the proper application of pressure to the trigger in order to discharge a round). Shooting is the action for which training and practice is intended. Of course there is more to it than the simple act of putting holes in paper, because ultimately you need to be training and practicing to put holes in people should the need arise. That being said, if we like pulling the trigger so much, why do so many shooters fail at basic trigger control fundamentals? Speaking from experience as an instructor teaching to citizens, LEOs and soldiers, I see a lot of sloppy trigger control, and I see it at many skill levels. Time and time again I see proper fundamentals sacrificed for speed. Shooters want to get rounds downrange as fast as possible (as they should) though they often sacrifice common sense techniques to do so. 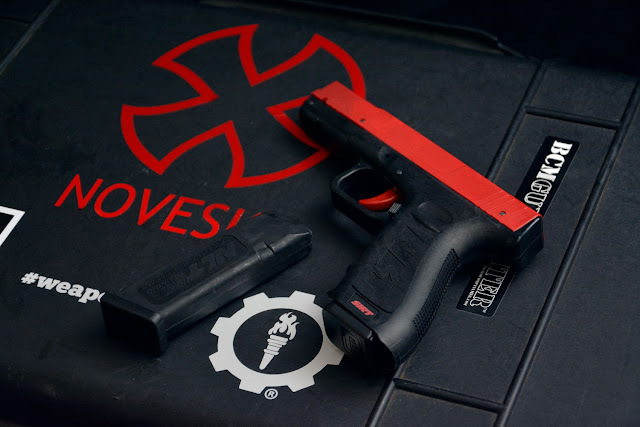 I don’t know if this is a conscious decision; outside of “bump firing” a weapon, there is no proof whatsoever that slapping the trigger will help you fire faster; quite the opposite as removing the finger completely from the trigger before coming back to make contact and fire another round is more physical travel for the trigger finger than maintaining constant contact. Yet, slapping the trigger and poor reset are common ailments I see from class to class. Don’t get me wrong, as often as I see poor trigger control, it’s not in a majority of shooters. If I had to do the math, I would say under half of all those I have taught came to me with bad trigger control, and of that, half were atrocious in their application of a very important fundamental. I blame speed shooting, at least partly. Don’t get me wrong, we need to be able to shoot fast. As fast as we can accurately shoot; any speed beyond that which is accurate is a waste of ammunition and a liability. Speed is required to win gunfights, as long as those rounds hit where they should and often. If you are clearing the holster in under a second and driving out a 4 shot string before another second goes by, you are close to the top of the apex. If those rounds are striking vital areas, you are even closer to the top of the apex. Of course, how much stress are you under while performing at this level? My guess is not much or not often enough. All things considered, a lack of realistic training is a negative. Access to realistic training can be cost prohibitive, even with those who have their priorities in order (training before high-end custom guns). Access to realistic practice is usually geographically dependent. Ranges that allow free and safe movement, drawing from the holster, use of cover/concealment etc. are usually ranges in rural or semi-rural areas, far from the urban dweller. Distance means travel costs, which hurts tight budgets. All of these things I understand, which is why I preach proper fundamentals practice as must as I can. Your performance will suffer under stress. The higher your proficiency with proper fundamental practice and application, the higher your performance will be under stress. If you build every skill to Unconscious Competence, you will be unconsciously competent when the time comes. If you are working the trigger for speed without first establishing a solid functional foundation, you are doing yourself a grave disservice. There is no “one method fits all” instruction for trigger control. This is a myth, a mistruth or impartial information based on institutional training practices. Ideally, we instructors want to relay as much instructional information as possible on a given subject within the shortest amount of time, provided the student understands and demonstrates that understanding. The key being “understands and demonstrates that understanding.” As instructors, we run the risk of developing rote memory speeches in which we speak at the student, not to them, spewing the same information over and over again course after course. The fact is, every student is different, and while guns by make and model are the same, not very student is going to arrive with a Glock 17 or a Beretta 92. Why is this important? How many reading this, upon getting your first professional firearms instruction, were given a speech or demonstration on proper finger placement for trigger control that was spoken to a group, not to an individual? If I were to use the method of proper finger placement that I was given as a 17 year old Infantryman (middle pad of the finger, just behind the tip, the “meat” of the finger on the trigger) then I would consistently pull my shots to the right, if only slightly. Why? Because of the size of my hand in relation to the length of my fingers in relation to the size of the grip in relation to the distance of the trigger from the grip, and we have to factor in the curve of the trigger as well as its overall width. This method simply does not work for me no matter what firearm I am using and I suspect I’m not the only one to experience this. Finger placement must be natural and adjusted if needed, not institutional and forced. 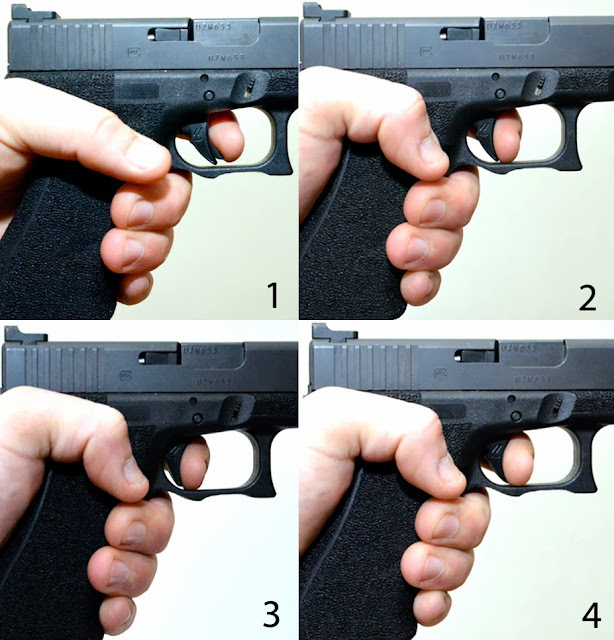 Obvious is obvious, though consider this; if your finger placement was taught as the “one size fits all” and you never questioned it, is your accuracy in regards to trigger pull what it could be? Finger placement should be comfortable and natural, making solid contact with the trigger surface in such a way that there is no contact made with the trigger guard or the sides of the trigger. When pulled, the placement should allow the finger to push back, not hook inwards. Elevation on the trigger should also be natural and as level to the angle of the hand as possible, bending the finger up or down can and will affect accuracy. Trigger pull is straight and even pressure to the rear, through trigger break, the weapon recoils through the cycle of operation. The actual pull should be strong but not convulsive, more of a press than a jerk. Proper practice will allow you to “know” the exact moment your trigger will break, which sets the foundation for speed shooting (which comes later). I will say this right now; the weapon going off should never be a surprise. The “it should be a surprise” is an erroneous instructional method intended to build comfort with shooting for those timid around guns, or for shooters with convulsive tendencies. The problem with this method is that it teaches the shooter that they shouldn’t know exactly when they will release a lethal projectile….when you think of it like that, doesn’t make much sense, does it? Trigger reset is the act of decreasing pressure on the trigger to physically allow it back out, resetting the trigger to fire another round if needed. The proper release of pressure is not to the full extension of the trigger, rather it should be to the point where the weapons sear (or sears depending on the weapon) resets, literally at the point of trigger break in which if the shooter stops releasing pressure and instead reapplies pressure, the weapon will fire again immediately with very minimal trigger travel. This is not an easy skill to develop due to the inherent requirement for precise fine motor skill control. This is also not a skill that can be developed just with live ammo. For speed shooting, trigger reset is far more important than trigger pull as the total length of the trigger is only pulled on the first round; every round thereafter until rounds are no longer needed is discharged from the reset point (this is true of striker fired and DA/SA weapons, as a DA/SA trigger will require less pull from reset to fire, but it is still present). Trigger reset control is perhaps the hardest part of trigger control to learn and the most perishable skill. Improper reset is either riding the trigger all the way out to its resting position, or coming completely off the trigger at any point and then going back on to fire again (“slapping the trigger”). Another aspect of consistent trigger control is when to go to the trigger. As the cardinal rule (one of four) reads, “keep your finger straight and off the trigger until ready to fire.” “Ready” is the subjective condition of this rule. If I am drawing handgun to confront a threat, or raising a rifle to do the same, at which point can my finger go to the trigger? Before sight picture? After? During? What if my threat is so close that sight picture is impossible to achieve without a waste of precious time or because my threat is so close (arm’s reach) that a full extension of the weapon is not possible? For a handgun, my finger goes to the trigger as soon as the barrel of the weapon is pointed in the direction of my threat, which is as soon as it clears the holster, at the hip. I can either fire from the hip or punch out to full extension, establish a two hand grip (or maintain a one hand grip depending on the situation) and then fire. For a rifle, the safety is disengaged as the weapon is raised to the threat and the trigger finger goes to the trigger. Another consideration is this; if I am aimed in on a threat issuing verbal commands in which failure to comply will result in the use of lethal force, should my finger not be on the trigger? Action is nearly always faster than reaction. If I have an expectation of needing to use force, then I am “ready” to do so. If someone only practices to go to the trigger when they are going to fire as soon as trigger contact is made, accuracy can suffer. If you have a reasonable expectation of using force in the near future against a clear and present threat, perhaps you should be on the trigger. Of course this is a competency issue. If your skill level is not at a realistic level of unconscious competence, this may not be a technique to practice until it is. Trigger control consistency requires a great deal of dry fire practice. Because most firearms require the slide/bolt to cycle in order to reset the trigger, practicing trigger control is somewhat difficult without manually working the slide, cocking the hammer, racking the pump or working the charging handle but it is doable with the majority of modern firearms, especially if you have a practice partner. Solo practice with dummy rounds or an empty chamber is as simple as assuming your shooting stance, acquiring a sight picture and slowly pressing through the initial trigger pull. Upon the break of the trigger, continue to apply pressure until the trigger is at is maximum point of travel, work the slide/pump/charging handle with your support hand while holding the trigger to the rear, and then slowly let the trigger out until the trigger resets. With nearly every firearm, the trigger reset can be heard as an audible “click” and felt as a change in pressure. As soon as the trigger resets, cease the release of pressure and work through another trigger pull. Repeat as time allows and then move onto another skill practice. The next time you practice trigger control, start from the holster or a slung position, but maintain the slow and methodical speed. Every few revolutions holster the weapon or go to a slung position. Repeat as practice time allows. For every following practice session, build up speed as competency increases. If you find yourself letting out too much slack or slapping the trigger, slow it down and build competency. During range time, begin and end each session live fire with a few minutes of dry trigger control practice. Focus heavily on reset. A practice partner can focus on your finger placement, pull and reset and watch the weapon for undue movement while you practice to identify any potential technique issues. With a practice partner, the slide or charging handle can be manipulated by your partner while you maintain a sight picture. This can be a bit difficult for your partner to perform at first, as the amount of pressure they will need to exert on the weapon to cycle the slide or bolt will disturb the shooters stance and grip to a degree until the technique is familiar, though it is a priceless technique insofar as the shooter does not have to release their shooting grip to cycle the weapon themselves. Of course with a pump action shotgun, this technique is of little use as the pump much be operated to fire another round anyway. As with the first technique, your partner can monitor your trigger control and help identify any potential issues. When it comes to live fire, I strongly recommend a practice partner who has a good understanding of trigger control. Your partner (or you, when you are the partner) needs to get almost uncomfortably close to the shooter’s grip and watch their trigger operation, don’t watch the target because those holes are not going anywhere. Focus on the trigger operation and if it disturbs or is disturbed by the grip, concentrate on reset and assist them in ceasing the release of pressure as soon as the trigger resets. The purchase of a training aid such as a SIRT pistol is priceless for trigger control practice, though is cost prohibitive (save up and get one, you won’t regret it). The Next Level Training SIRT is unique as a training aid in that it has two visible lasers, one projects when the slack is taken out of the trigger, another when it breaks. Any time the slack of the trigger is released, the trigger set laser goes off, which means if you are slapping the trigger there is a visual reminder not to do so. 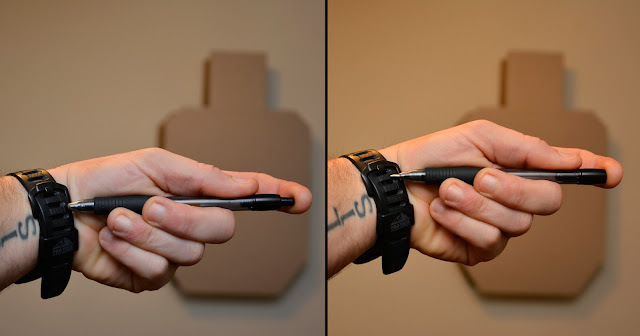 Outside of that, a traditional click operated pen is an inexpensive training aid. Held in the hand as you would hold a weapon (ran along the index finger with the index finger on the pen clicker as it would be positioned on the trigger) you can practice the general method of trigger control all day long. For building speed competency on the trigger, I find that this method works best outside of the SIRT. You can reach a point where correct operation meets rapid application and when live rounds are fired, you will find that you can press out accurate fire amazingly fast (just a few months of using a click pin, along with good dry fire practice shaved .5 off my split times without sacrificing accuracy and this was more than a few years ago, my split times have improved since then). Finally, I highly recommend filming yourself while shooting, even if you normally have a practice partner. Take the time to get a few minutes of uninterrupted film of your overall technique with a close enough shot to focus on trigger control. If you run a shot timer when working trigger control practice, be sure to film the splits and first round time and then get a quick view of the target so months or years down the road you can compare for improvement and more immediately, identify issues and correct them. We all want to be able to shoot fast; we all want to be able to shoot accurately. Don’t sacrifice the latter for the former because its accuracy that ultimately wins gunfights. Train accordingly. Aaron Cowan is the Lead Instructor for Sage Dynamics, a reality-focused firearms and tactics training company that provides practical instruction from the fundamentals to advanced skills for the civilian, police and military professional. 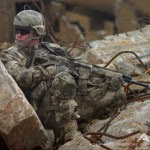 Aaron served in the US Army as an Infantryman, as a private security contractor overseas and as a police officer. In addition to patrol he worked as a a SWAT team member, SWAT deputy team commander, SWAT sniper, sniper section leader and in-service police training officer. 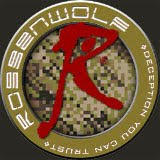 Aaron holds multiple professional certifications including the National Rifle Association Law Enforcement Division’s instructor training program, California POST certified academy instructor, Advanced Law Enforcement Rapid Response Training (ALERRT) Active Shooter Response Instructor and Simunitions Scenario Instructor among others. 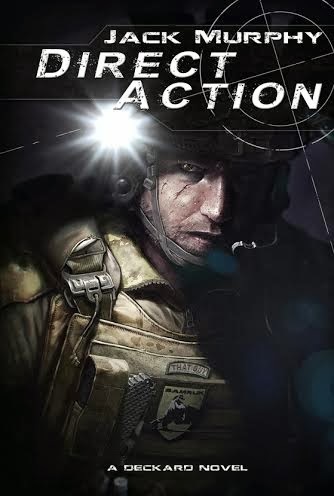 When he isn't teaching or training, hes writes semi-regular for Recoil (web) and Breach Bang Clear among others." For full course details and training schedule visit SageDynamics.org. Receive the latest updates at their Facebook Page.